Marble comes in an incredible array of colors, so you don’t have to choose the white and tan shades that are so popular. In fact, modern homeowners are often more interested in dark shades that will add visual appeal to a room and give it an upscale touch. If you’re looking for darker tones, then Nalboor Tiles has what you’re searching for. We carry the top four dark colored marbles for your home or office. A product of Spain, Emperador Brown marble is a timeless classic that’s every bit as attractive as Bianco Dolomiti. Quarried in Spain and then brought directly to our Florida warehouse, this marble has all the brown and tan shades that you’ve been dreaming of. Most of the tiles have a honeycomb pattern that stands out beautifully and adds an elegant look to any space. It makes stunning countertops, shower walls, and floors. While it can easily be used across a foyer or living room, you may find that it’s best use is as a border against a contrasting color. Use it on the treads of your stairs and have the risers fitted with wood or white marble. Install it around a fireplace for an elegant look that won’t show every smudge. Install it as the floor in your bathroom with wood wainscoting and Calacatta Gold marble on the walls. The options are limited only by your own imagination, so you can really get creative with this brown marble. 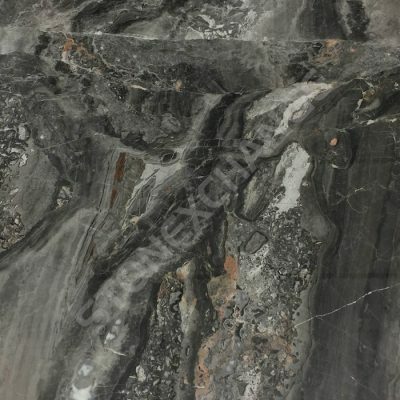 Dark grey and black dominate the color scale for this elegant marble. Pietra Gris Montana may even have some exotic red veining that adds dimension and movement to the finished pieces. A top choice for hospitality centers, it will also fit in nicely with your own living room or kitchen. This marble looks stunning with any modern décor, and it can make white cabinets stand out and shine. It contrasts nicely with Crema Marfil marble since they have similar veining patterns, so you can mix these coordinating options to create a magnificent pattern on your floor. You can also use it as a border around your backsplash or in a larger room. Use this as the base for your modern floating tub or sink to make your powder room stand out and feel more luxurious. You can also use this dark shade as an accent in any room. Install it around a medallion in your living room, or use it on just one wall in the shower. Balancing this dark shade out with lighter colors will help prevent it from overwhelming any area. Dark marble shades don’t have to focus on black and brown colors. Rojo Alicante is a natural marble that features beautiful shades of red and maroon. It’s ideally used as an accent in rooms, and you’ll love the unique feel it lends to any space. Here are a few ideas for incorporating this lovely material into your home. • When building a custom closet with cabinets, use this red marble as the countertop. • Install it as an elegant border in your showerstall to add some burgundy tones to the space. • Heat up your cooking area visually by using it as the backsplash around your stove. • Install it on the patio for a fun addition that offsets all the greenery nicely. • Accent the edges of your built-in garden tub with Rojo Alicante tiles, and tie them in with borders and counters. • Install Rojo Alicante tiles where an area rug would go and then border it with a decorative tile to create a faux carpet that’s easy to clean. There are countless ways to use this luxurious tile in your home. It’s ideal for all types of wet areas, including shower walls. You can also use the tiles as a flooring material or shower walls, or even a fireplace surround. If you crave the look of wood but want the easy maintenance of marble, this Bamboo Gray Wood marble is sure to please you. These marble tiles have horizontal veining in darker shades of gray and black, so they closely resemble a wood grain. You can use it in any area where wood is appropriate, and you can also install this tile in zones where wood won’t hold up. This means that you can have the look of your wood in your basement without adding a subfloor. The tiles can go directly on your concrete floor without worrying about the higher humidity levels damaging it. Use these tiles with confidence in wet bathrooms and kitchens where wood will absorb more moisture and lose its finish. This marble is even ideal for your patio. Resistant to water intrusion and unaffected by the heat or cold, it can survive the harsh climate of most outdoor settings. This allows you to give your outdoor space a more comfortable, interior feeling that is sure to enhance your home. Wood is typically seen on floors, but you can also install these tiles on walls. One great option is to put the vein in a vertical direction to lift the line of sight and make any room feel taller and more spacious. When it comes to your home décor, you can enhance your living space while keeping the budget under control. The key is to work with wholesalers who sell directly to the public. Here at Nalboor Tiles, we’re happy to provide you with the same high-quality tiles and excellent pricing that contractors can access. We’ll help you choose the right pieces for your project, and our friendly representatives can even assist you with the order. We have bulk rates available, so your price can drop as the order size increases. Visit us online to look at our impressive selection or call us direct at 305-501-4548 to place your order. You can even contact us online.